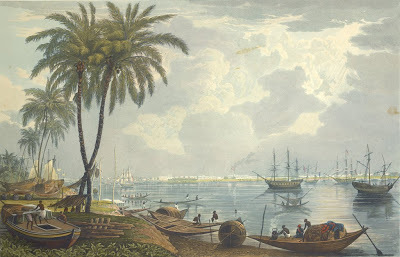 Plate twenty from James Baillie Fraser's 'Views of Calcutta and its Environs'. Fraser (1783-1856) arrived in Calcutta in 1814 and in six years had produced these animated sketches of the busy city. He included in his collection two lovely views of the river. This one was taken from Shalimar Point opposite Kidderpore, "where the river bends round to the west. Here Colonel Robert Kyd, who persuaded the Company in 1786 to establish the great Botanic Gardens just downriver at Sibpur, and who became their first Superintendent built his famous domed house called Shalimar From here Fort William occupies the centre of the composition with the buildings of Esplanade Row and Chowringhee Road spread around it."